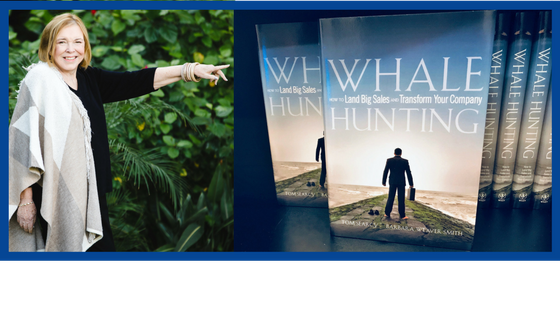 Ten years ago, in January 2008, Wiley published Whale Hunting: How to Land Big Sales and Transform Your Company, the book about large account sales I co-authored with Tom Searcy. For several years prior, Tom and I had been building out The Whale Hunters Process™, which we laid out in that book, and testing it with clients. 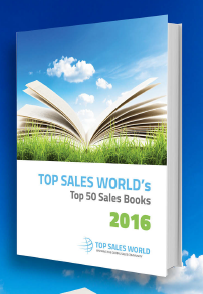 The book has been well-received in the sales and business communities since its launch; Top Sales World named it to its Top 50 Sales Books list in both 2015 and 2016. Later in 2008, Larry Smith (my husband and business partner) and I purchased Tom Searcy’s 50% interest in The Whale Hunters LLC, which we had jointly owned and operated. Larry and I became the owners and cultivators of the “whale hunting” brand through our own company Smith Weaver Smith, which later became a new company– The Whale Hunters, Inc., in business since 1996. Having started out it Indianapolis, we moved the company officially to the Phoenix area in 2009. We have clients throughout the United States and in Canada. Now that you know a little history—what’s the point? Of course, I want to celebrate ten years of Whale Hunting success for a moment or two, but more than that I want to invite your engagement with three projects I’m launching for Q1 2018 and beyond. To update my book, in January I’ll be writing and inviting discussion about the major changes, disruptions, and trends in enterprise sales that I’ve seen take hold in the ten years since 2008. With your help, I will be publishing an update on how each trend influences my revised thinking about The Whale Hunters Process™ ten years later. Disruptions to both system and seller—I am not sure which these influence more. Probably Sales 3.0 (or beyond)—that is, whatever form artificial intelligence ultimately takes in large account selling– will totally disrupt both system and seller as we know them today. Introduction of technology tools—these take time and money, focus and refocus attention and may or may not actually improve sales and selling. In February, I’ll be writing and discussing primarily what I’ve learned from my clients over the past ten years since the publication of Whale Hunting. I’ll undoubtedly compare and contrast that a bit to how I worked with clients before I co-invented The Whale Hunters Process™. I did not come to whale hunting from a traditional sales background. More on that later. But I most definitely came to it from a “big deal” background! The deals I was coaching and facilitating, however, were not between a buying company and a selling company, but rather among community organizations in different economic sectors that wanted to become strategic partners in some grand enterprise for the common good. They needed to agree on a structure, purpose and goals, a mission, and a plan. Then they needed to raise a great deal of money to make their dream a reality. Because it is a management-driven system, it must have active leadership from the senior company leadership. 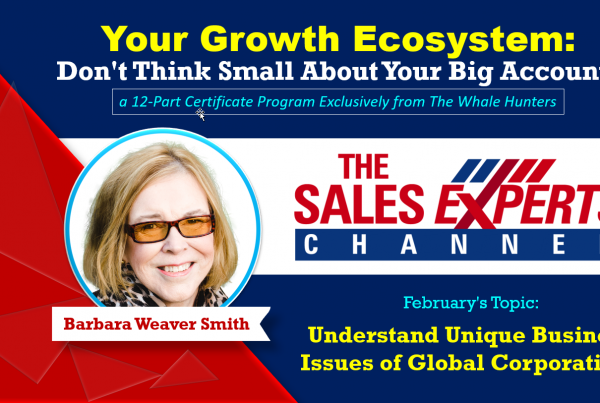 The sales leadership team can’t accomplish it alone. It requires a total collaborative effort by company leadership. That said, it also requires empowerment at every level. Whale Hunting is a culture change. It takes time and reinforcement to build it in. The change process and the Whale Hunting Process are two different processes. As the company grows, small company entrepreneurs often make big mistakes in hiring sales people and sales managers. What’s the best way to help them improve? Companies are rarely customer centric. They are product-centric and company-centric. Processes are constantly undermined by the short-term emphasis on quotas and quarterly goals. 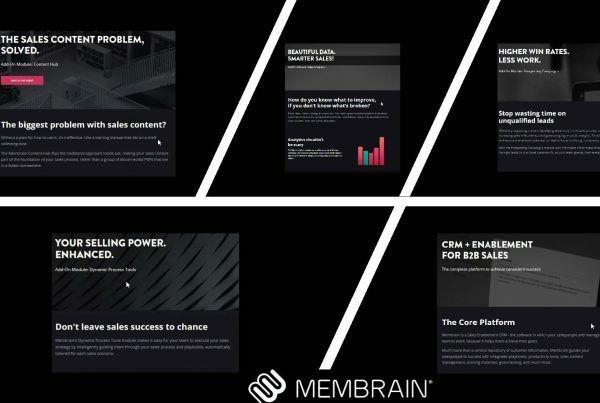 Sales training, if any, is often divorced from sales strategy, business development, and especially team selling. Companies of all sizes are not very good at growing business with existing clients. Software companies, especially, often see their entire team engaged in continual fire-fighting rather than new business development. It’s tragic! 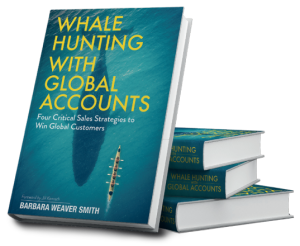 In May 2016, I published Whale Hunting with Global Accounts, in recognition that most of my whale hunting clients had landed more than one “whale” that had a multinational or truly global footprint. My premise is that these accounts call for another stage in the whale hunting process—growing new business inside a global account. But I have been surprised in marketing that book how many companies with accounts like that are quite reluctant to move their business beyond a local or regional level; and, in fact, think it’s presumptuous to even call that a “global” account since they only do local business. To me, the seller should think of the account the way the account thinks of itself. If it’s a global company, it thinks globally in many ways—and if you only treat it locally, you are setting up for disappointment if not for big failure. I did a small survey in August to learn more about this issue from small business owners, but I need more responses. So I’m happy to announce that I will partner with Nimble during Q1 do conduct an extended survey of small businesses about their global accounts, what kind of business they are developing, and how Nimble and The Whale Hunters can help them expand globally if they have an interest in doing so. I hope many of you will help to give us insights and participate in that study as well. Well ,hat’s my opening salvo for 2018. I welcome your comments, questions, advice and other feedback. And if you have been whale hunting over the past ten years, would you share some experiences in the comments below? 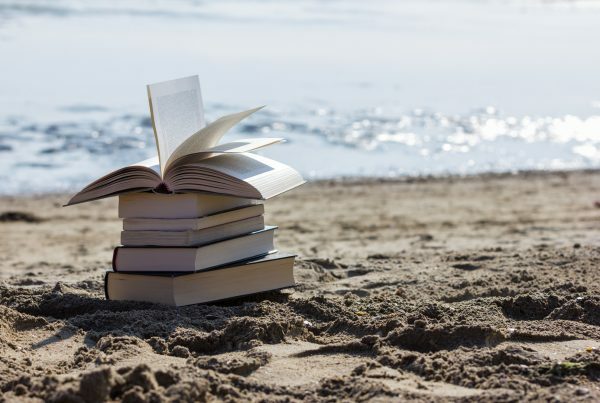 If you have read Whale Hunting: How to Land Big Sales and Transform Your Company sometime during the past ten years but have never written a review, perhaps you’ll find your copy, give it a skim, and give it a little amazon.com attention. And if the book is unknown to you, I invite you to check it out at amazon.com or barnesandnoble.com and other outlets. It’s available in hardcover, kindle, and audio versions. Reviews are most definitely invited and welcomed.